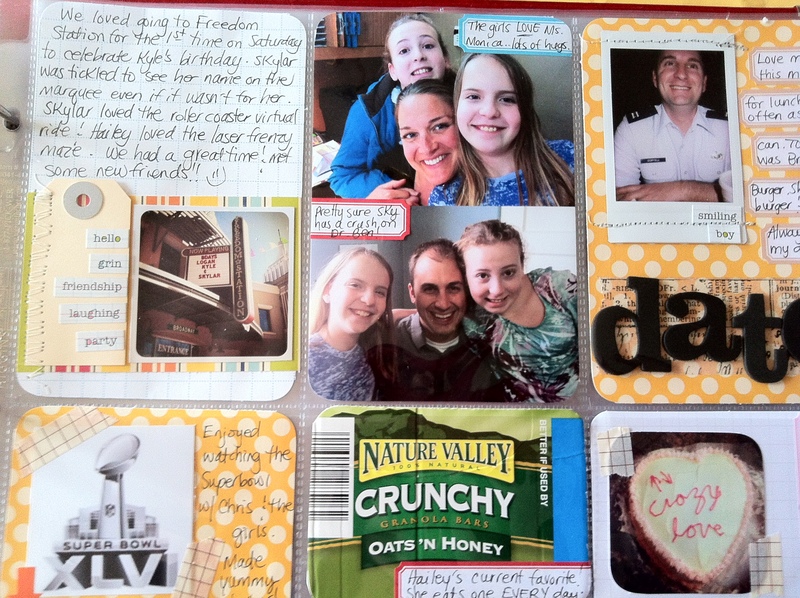 Project Life: Week 6 | I am JuJu! ← Who Are We To Say? Well, let’s get on with it shall we? As always first up is a picture of the whole week. The left page is the Design A protector and the right page is Design F. I usually stick with Design A, but this week I just wanted to mix things up. I love bright colors & always like to add splashes of color to my pages. I also included the pink receipt from the towing company from when I had a tire blowout on Monday. 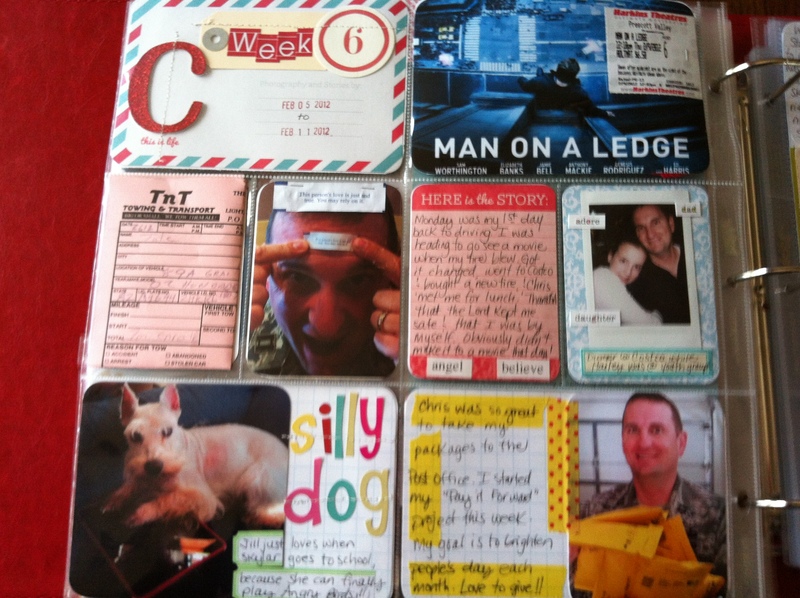 Used washi tape, word stickers, & Martha Stewart labels for some journaling. I enjoyed adding smaller square instagram photos (2.25 inches). They are a fun size to work with. I also love learning new things so this week I used this tutorial by Ali Edwards to learn how to print 2 3×4 pictures on a 4×6. I had these cute pictures of the girls with some of their favorite people…Monica, the receptionist at our chiropractors office & Dr. Ben, our chiropractor. Skylar seriously has a crush on Dr. Ben; she thinks he is “so handsome!” I used the tutorial to crop the images & merge them together for a vertical picture slot. So there you have it! Week 6 complete! I’m linking up with The Mom Creative and her Project Life Tuesday group. Head over and check out all the awesome inspiration. This entry was tagged documenting the everyday, project life week 6, washi tape. Bookmark the permalink. Thanks Sarah! I really enjoy being able to add memorabilia to my album. Hailey had failure to thrive & continues to have some GI issues (mainly reflux) even now (she’s almost 11), but otherwise she is doing really well. She also had the mic-key button. Loving the way you used the design F page protector – I just got my new page protectors this week and can’t wait to mix it up! Those little square photos really work in the pages, and I love how the pink receipt adds both story and colour. Great pages! Thanks Jules! I’m enjoying mixing up my page protectors. Keeps things interesting. Loved seeing what you did with design F pages! Thank you Debbie. I love using different page protectors. It definitely makes me stretch my creativity. Thanks for stopping by! 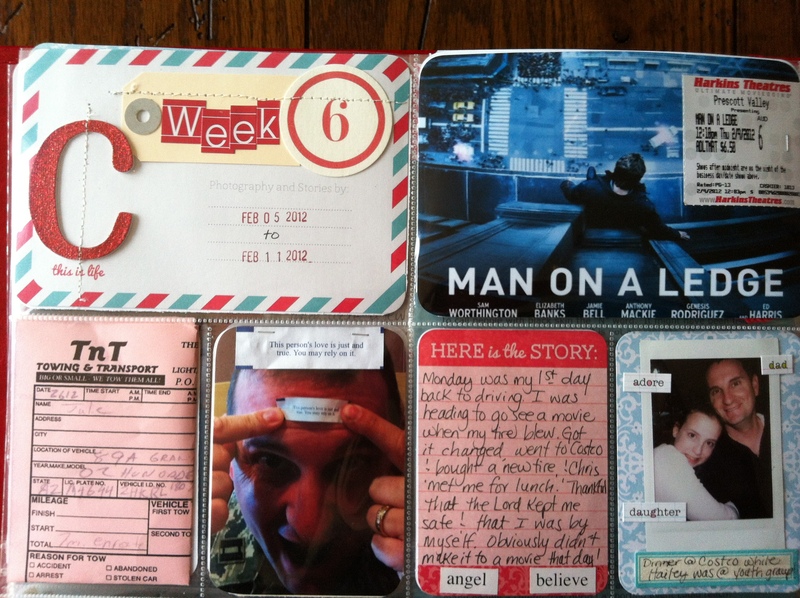 I just love your blog and seeing your PL layouts each week! You and Jenny are my 2 new favorite bloggers (and Jeff too – lol)! I just relate to all you share and LOVE seeing your PL layouts every week! I’m doing it for the first time and get oodles of inspiration from both of you!!! BTW Your silly dog is adorable! Thank you for your kind words Karen!! I’m thrilled that you are getting inspiration from our PL pages. I so love this project! Blessings to you! Great week Julie – the 2 different page protectors look great – I am going to have to get some of my other designs out too. Your week looks so busy – there are so many stories going on in those pages. I really like how you capture the everyday – fave commercials, food packets etc. Thanks Sharon! Our weeks are definitely busy. I’m trying to add in the everyday stuff that I probably wouldn’t have added to a traditional 12×12 layout. I must say that this is one of my favorite things about PL. I need to include some of our favorite foods too. Great thing to document. Thanks Cami! It’s quite a big deal when either of my girls try something new as they both have various sensory issues with food. It is the perfect thing to document! Thanks Kate! Going to the movies each week has become one of my favorite things to do. I did see The Help and really liked it…totally LOVED the book. Thanks again for stopping by! Thanks Nicole. I have really enjoyed mixing up my page protectors. There are a couple I’m intimidated by so I just need to bust them out and conquer them! Thanks so much for stopping by! Love your pages! 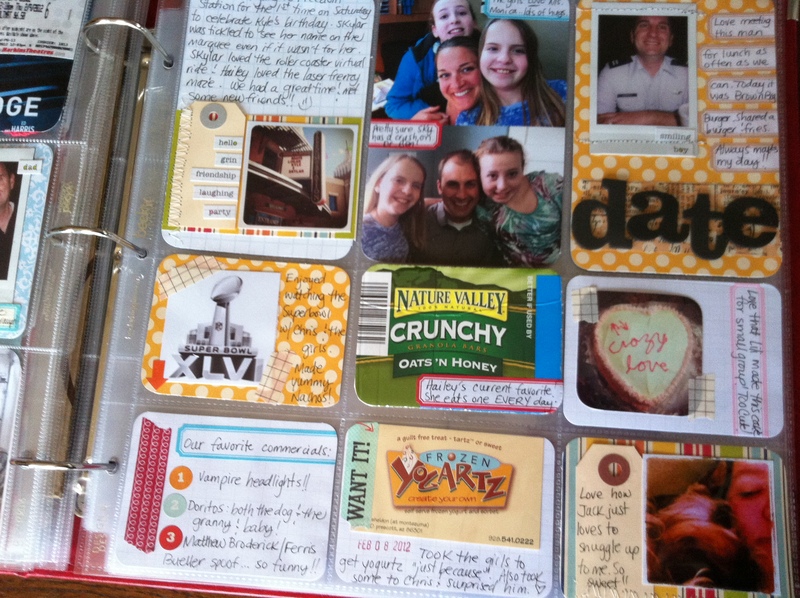 Great mix of embellishments and love how you used two different page protectors, too! Hugs! Thanks Kristina! You are always such a great encourager to me! Hugs to you as well! thanks for stopping by my blog. i love the way your project life looks–that’s just what i’m going for. i love all the little bits of daily life you have added in. also like how you used different page protectors to vary things a little. Thanks for stopping by Susanne! I truly love adding all the extra tidbits in my pages. My husband says he loves that b/c he feels like he re-lives our weeks by looking at them. Great pages. I love the movie picture with the ticket! Great use of daily bits & pieces. Love that movie ticket on the movie poster pic! If we ever make it to a movie, I am going to totally add the poster pic. I love that your hubby is taking such an interest. After 2 years of project life, my hubby still wants his picture to be my “picture of the day”, cracks me up but I oblige. Positive appreciation is so helpful. Great pics this week too! I love all the little extras and embellishments on your pages. The colors are wonderful too. I’ve been meaning to do instagram all year too- they look great! your pages are great! Love the instagram stuff! Thanks for the comment on my blog! Beautiful pages. I love the sewing! Hi Julie – you’ve commented on my PL a few times now, and I’ve finally had a chance to come check out yours. I LOVE IT!!! It’s so colourful and vibrant and full of LIFE! 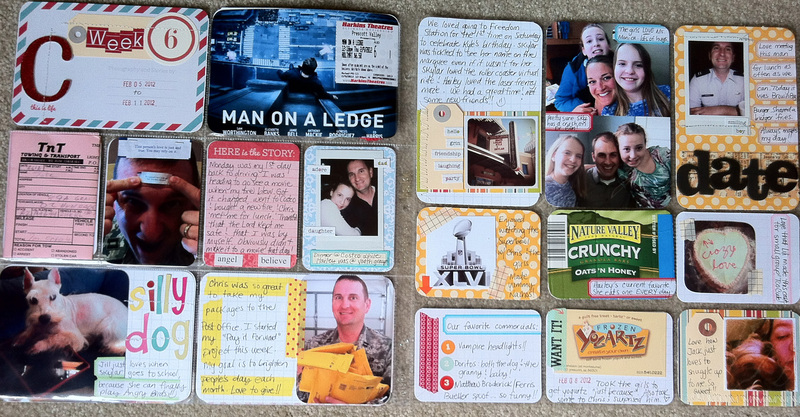 I love the yellow polka dot paper and the combination of all different sizes and types of photos, mixed in with ticket stubs and packages and handwritten journaling. That’s the only down-side to the digital version – not being able to add in the extra bits. You’re family is beautiful! Thank you for sharing! Love seein pages besides Design A. Don’t get me wrong…I love Design A, but seeing other pages used so beautifully always gets me inspired to keep mixing it up! Another beautiful week! Thanks Roberta! I will be including the pantry re-organization hopefully next week. Didn’t get it done before my trip to Phoenix for a few days, but it MUST get done this week. Thanks so much for your encouragement! I love your spread with all the little details! They’re always filled with amazing photos! I have also started to venture out of my comfort zone and used a Design F protector on my Week 5 and I’ve loving it so far. I’ll try to use other designs in the coming weeks. Thanks so much for sharing! Thanks Leena! You are such an encourager!! Loved your pages this week with the Design F protector. Love, love, love! ♥ So colorful and creative and full of LIFE! Love your extra bits and how you captured your week ~ great job! Thank you so much Michelle! I love color & try to add as much as I can each week. Thanks for stopping by! Thanks Emily Kate! When I go to the movie I always slip the movie stub in my coin pocket of my wallet…that way I always know where it is. Thanks for stopping by!